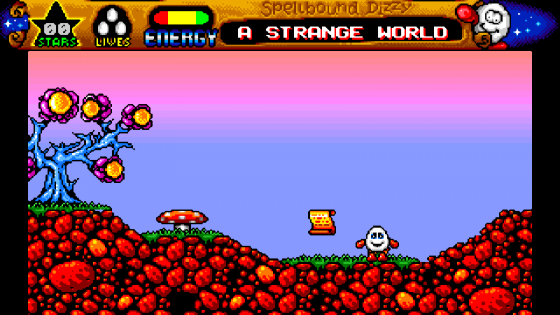 Developed and published in 1992 by Codemasters Spellbound Dizzy is just one game in a long series of egg related shenanigans involving the Yolkfolk (this time with the help of Theo the Wizard). 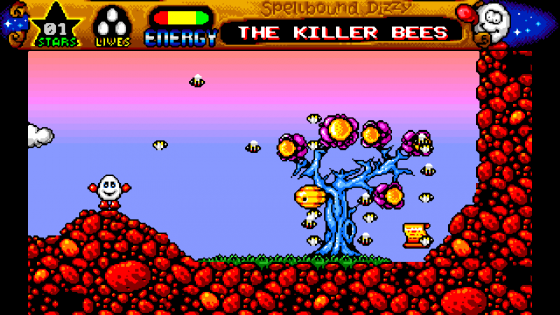 Each game follows the usual set of rules and gameplay, (puzzle solving platformer with inventory menu and dodgy music) but each retaining its own unique charm. The series was originally developed by the Oliver twins, two British brothers, Philip and Andrew Oliver, who started to professionally develop computer games while they were still at school. However, they had little involvement with this title other than signing the game off and letting Big Red Software take over the design and development aspects of the game. The game itself is well drawn and immediately boasts about its size *cough* but never really gets further than that in the interesting stakes. 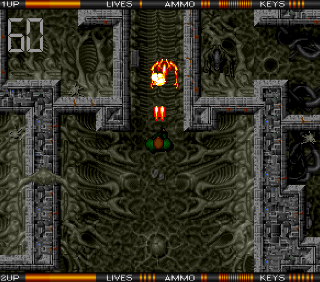 The graphics are bright and colorful, the usual combination of cartoonish scenery and well drawn objects throughout. 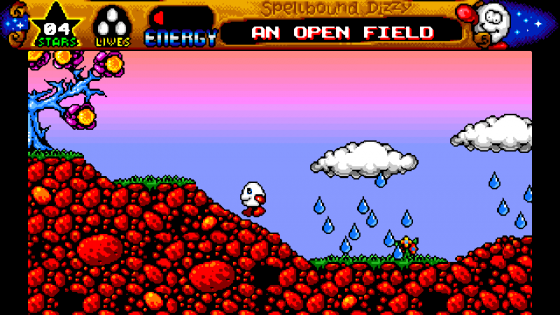 However, compared to earlier games, this one seems inferior in design and presentation, even with the extra animation scenes such as Dizzy becoming stunned, swimming and the mine cart. 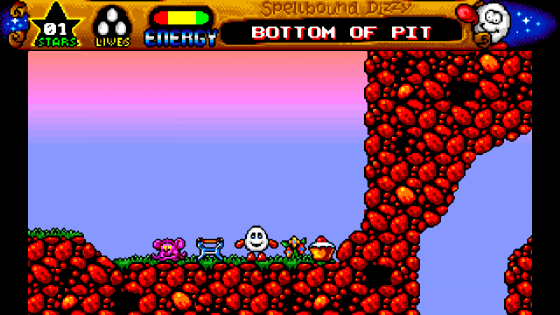 Spellbound Dizzy does feature some minor differences in game play from other Dizzy games; fruit and cakes are dotted around to restore energy, water doesn’t kill instantly, although without the aqua lung drowning is inevitable, and the mushrooms (magic?) 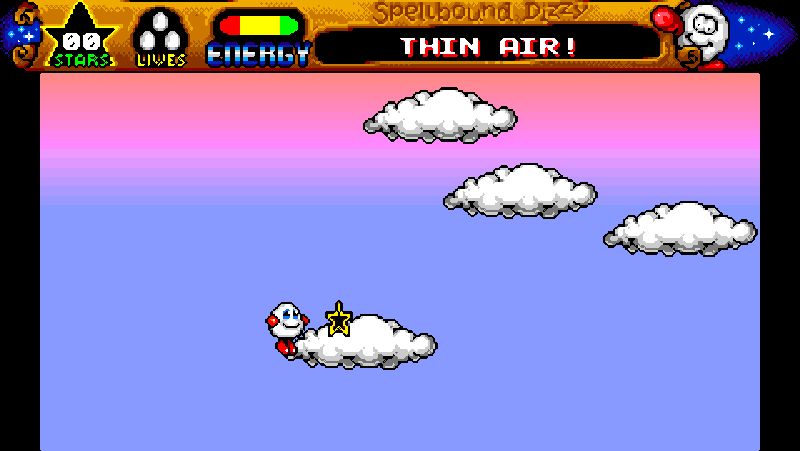 are spinny objects that can propel Dizzy to greater heights, allowing him to reach unseen platforms and the odd cloud. Unfortunately these minor differences in game play don’t really make up for the lack of storytelling (it’s nice to have a little bit), puzzles that don’t seem to make much sense, and some very irritating music. 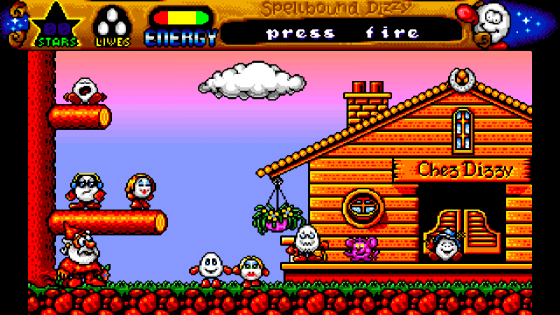 As much as I love other Dizzy games this one didn’t work for me, childhood memories tell me it was a lot more fun ‘back in the day’, in my opinion there are better games in the series, Fantasy World Dizzy (1991), Magicland Dizzy (1991), that are genuinely still fun to play as an adult. Need more Dizzy? 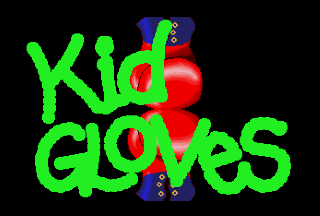 Visit this fan site for more info!